Recently I discovered this great page on the FileMaker Inc. site that I thought would be useful to many. The above screenshot is just the top part of this long table on the FileMaker Site that goes back to FileMaker Pro 5.5 amazingly enough. 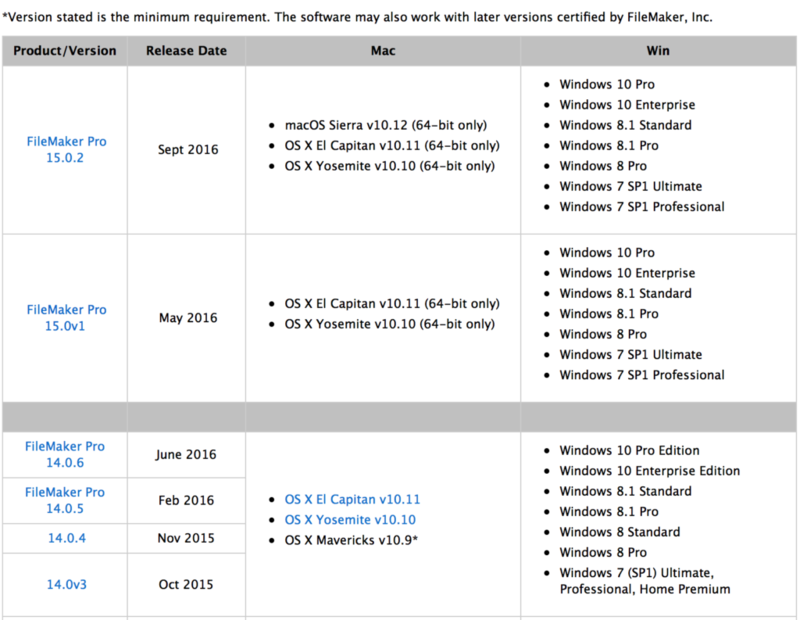 Since individuals and firms often have Macs and PCs of different vintages, it might take some time to figure out if any computers need to be replaced or updated to accommodate a particular version of FileMaker Pro. In my case most of my clients are Mac-based, but lots of the firms I work with have at least one PC somewhere and they want to use it too. Since I need this information, I copied and formatted the information into an Apple note in my FileMaker folder, so I could always have access to it. I hope you find this table helpful too. You could always just stash the URL above somewhere handy like I did at the top of my Apple Note. This entry was posted in FileMaker 14, FileMaker 15, FileMaker Facts, Macintosh, macOS Sierra, Windows on October 5, 2016 by janet. If you are using or creating a FileMaker database and want to provide a satisfying experience via FileMaker Go, you will need the best information available about how FileMaker Go differs from FileMaker Pro. You will need advice about changes you can make to your current FileMaker database to make it data-safe and touch-friendly to iPhone and iPad users. There is some overlap between the three, but beggars can't be choosers at this preliminary phase of the FileMaker Go learning curve. Soliant's free FileMaker Go Toolkit is a must have compliment to Scott's above listed Tech Brief. The brief takes its examples from the Toolkit. This iPhone screenshot is an iPhone layout in the toolkit. You get lots of great graphic parts too. You can peruse some scripts. This free toolkit will help you build your first FileMaker Go layouts and look good while doing it! There are other blog posts and resources out there. These are the top four. As I discover other essential resources, I will post them on FileMaker Fever. This entry was posted in FileMaker Facts, FileMaker GO, FileMaker Resources on September 8, 2010 by janet. Matt Petrowsky has done it again. He released a free one hour video on Saturday that walks you through a particularly confusing aspect of relationship creation in Filemaker 7. The video article is called Graph Rules – Four rules to remember and is available at the ISO FileMaker Magazine site. I recommend this video for anyone who is grappling with how the relationships diagram works. If you are knowledgeable about FileMaker, you probably will get more out of this than if you are a newcomer because you have habits to break. But he’s managed to make it work for either audience by covering basic principles in the first part and then tackling a tricky *rule* later on. Matt includes a free download with before and after file examples so you can practice and experiment with the first and doublecheck yourself with the second. 1. There shalt not be any circular references. Thou must have a start and an end between table occurrences. 2. Thou shalt have as many table occurrences as needed. The key to the graph is organization. 3. From wherest thou is, if thine eyes cannot see what thouest desire, another TO is what ye may aspire. 4. Along thy relationship chain, any given TO knows of all others but only through his brother. Right now, if you plan to do even moderately sophisticated development with FileMaker 7, you probably need all the help and repetition you can get. Take the hour. I followed along while lying on my couch with my Powerbook. This entry was posted in FileMaker Facts, FileMaker Resources, FileMaker Tips on July 27, 2004 by janet. Glenn Koenig has written a fascinating behind the scenes story about the early years of FileMaker based on a phone interview with one of the original four founders of Nashoba Systems, Spec Bowers, called The Origin of FileMaker Pro. This entry was posted in FileMaker Facts on April 3, 2004 by janet.